The novelist discusses the vitality of immigrant representation and tells us her book’s a little dash of Thelma and a little bit Louise. 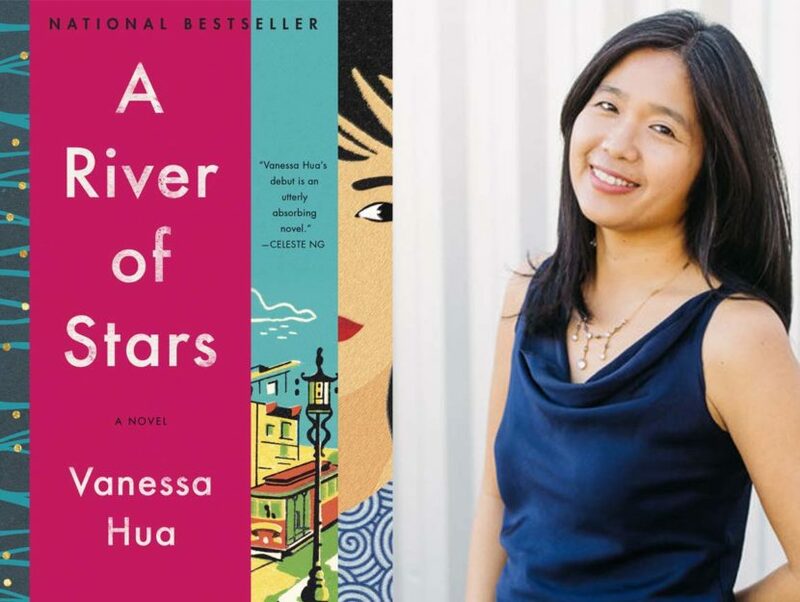 Vanessa Hua’s propulsive, wildly unpredictable novel, A River of Stars, introduces us to Scarlett Chen, a young mother-to-be adrift from everything she knows and sent to Los Angeles by the father of her unborn child—a man who also happens to be her boss. Ensconced in a secret maternity home until she gives birth, thereby granting U.S. citizenship to their golden child, Scarlett’s life is upended once she receives surprising results from a sonogram. Setting off a journey to San Francisco’s Chinatown with another young mother, Daisy, in tow, Scarlett seizes on her chance to snag a piece of the American dream, unaware that her baby’s father is all too close in pursuit. Recently, Vanessa Hua spoke with Read It Forward’s Abbe Wright, delving into the joys of publishing a debut novel, how vibrant the bookseller community truly is, and how community and understanding is utterly essential. READ IT FORWARD: A River of Stars is your debut novel, but you’ve also published a collection of short stories, right? How has the experience been publishing your first novel? VANESSA HUA: Yes, Deceit and Other Possibilities. It’s like every dream come true, from the book events where I see friends new and old, and I think I had an event where an elementary school teacher showed up. VH: Yeah, and then other people who have only interacted over the internet, but now I can meet in real life. It’s really exciting, and to see booksellers when you drop in for events, or to sign stock, they’re always so supportive and encouraging. It’s wonderful to get notes from readers who tell me, ‘I feel seen, I feel made visible.’ There’s a big question of representation, and to finally feel like there can be multiple narratives, and that we hold multitudes even within ourselves. That’s something I was trying to get across in the book, and I think that’s how it’s been resonating with readers as well. RIF: So, for those who may not have read A River of Stars yet, would you tell us a little bit about what it’s about? VH: The main character is a factory clerk named Scarlett Chen, who is sent to the U.S. by her married lover, her boss, to give birth so that their child will have U.S. citizenship. But when a sonogram reveals something and he betrays her, she takes off with a teenage pregnant stowaway, Daisy, and they make their way to San Francisco’s Chinatown. RIF: It’s funny. It’s moving. It’s heart wrenching. This book has a pacing, I wouldn’t call it at all a thriller, but you’re definitely turning the pages dying to know what’s going to happen next. How did this idea come to you? VH: I was living in Southern California, pregnant with my twins, and I began hearing about maternity hotels, and the suburban neighborhoods east of downtown L.A. The neighbors were baffled, wondering why are all these pregnant women coming and going, why are the garbage cans overflowing with diapers? It sounded like a brothel in reverse, and it turned out they were coming here to give birth for U.S. citizenship. There was one new story I read in particular that really stuck with me. A neighbor had said that a pregnant woman showed up on her doorstep, rang the doorbell and said, “I’m hungry,” and he took her to McDonald’s. It made me realize that, you know, the experience of living in one of these mothering hotels could be very complicated. It’s a vulnerable time in a woman’s life. They’re very far from friends and family. I began imagining what kind of character might find herself in this situation, and maybe she was ambivalent about motherhood and why. So, that was how Scarlett was born. RIF: I love that. One of my questions was if these secret maternity homes are real, and I guess they are. VH: In fact, the websites are still up and operating in plain sight. You can get your choice of standard and luxury accommodations. RIF: We’ve heard stories about mothers doing incredible things, like the myth of lifting a car off her child, to protect their children. Scarlet seems to become more fierce and determined with motherhood. Do you think her baby imbues this strength in her? VH: Yeah, definitely. She left her village when she was a teenager, trying to make her way in the world, and she was very independent. Coming to the U.S., she begins to have these dreams for her child, but I think having a daughter also opens her up in a way. She’s been on guard by necessity all her life, and having a kid puts you out into the world. It puts you into a community, and that’s where her relationship with Daisy, another mother, is forged and with the apartment where they live in Chinatown. So, her transformation is both tapping into that strength that she’s had all along, but also realizing that she can’t always go on the run every time life is complicated, that it’s about trying to find community and roots, and that’s something I do believe children cause you to think about. RIF: She really becomes a small business owner, and really gets inventive in a way that allows her to stay in this community of found family. At its heart, this tale is one of an immigrant struggling to make it in America. What do you hope your novel adds to the collective sort of storytelling of immigrants’ voices? VH: That’s a great question. I think, or I hope that as with all books that I love, that people might feel invited into a vibrant new world, that they might recognize aspects of themselves in the characters or situations, and that they’ll want to share that experience with others. I think often, especially with immigrant narratives, or narratives from marginalized communities, there is room for only one narrative or that there’s only stereotypes or statistics. A River of Stars does kind of show that we do have different histories, dreams, flaws, and ambitions, and I hope people are able to really see the fullness of the humanity of each character, whether they’re major or minor. RIF: What this novel also got out for me is how difficult this “American dream” is to achieve. It used to be that anyone searching for a better life could come to America and hope to achieve that. Do you think the myth of the American dream has somehow disappeared? VH: Well, I think the American dream is still what gets us out of bed every day, that life can be better. I mean, I’ve reported from all over the world, whether it’s Burma or San Francisco’s Chinatown, and people in the most desperate situations, living under authoritarian regimes, are still striving. I think we do need to acknowledge there are structural inequities and that there are policies that are harmful that lead to groups not having equal chances. But all the same, I do think people are always hoping for the future, hoping for their children, and trying to figure out a way. It’s something that we need to acknowledge, and support, and try to really make those opportunities open to them. RIF: You just mentioned this, but how do you think your experience as a journalist writing and reporting from all over the world helped in writing your novel? VH: Well, it definitely gave me the discipline of writing daily and on deadline. Being a journalist gives me license to follow my curiosity out to the world, to ask people their stories, and to do research. The novel very much does reflect my two decades of writing about Asia and the diaspora on both sides of the Pacific, but all the same, I think where my fiction flourishes is where the official record ends. These characters may be inspired by things that I’ve reported on or read about, but yet in the end, they’re wholly from my imagination. RIF: In the novelization action, we get to see inside Scarlett’s brain, which when you’re writing as a journalist, you’re only privy to what sort of people tell you. VH: Or what I can observe. RIF: Yes. What do you hope, as readers are reading this for the first time, they take away from this story? VH: I hope they’re entertained, moved, that they feel like they come to a better understanding of Scarlett’s and Daisy’s decisions. It’s been interesting how people talk about the antagonists in the book, and those characters have a journey too. Even if you may not agree with their decisions, you understand better than just simply writing them off as a villain, and I want that. I hope that complexity of character comes through throughout. RIF: I think they each have a redemption in their own way, and I really felt for the boss in parts. That’s sort of the mark of really complex character characters is how you felt a different way the last chapter, but now my heartstrings are tugged.